Home > Blog > Make Your Own Chuncky Cowl With Arms ONLY ! Make Your Own Chuncky Cowl With Arms ONLY ! I know it’s summer, and it’s not time to think about winter & cold yet. But why don’t you start getting ready for it from now and on ? Here is an amazing tutorial that will help you knit your own chunky cowl using your arms, and nothing else but your arms ! Watch the video below, follow the steps that are easily explained, and you’ll see that you can finish it within one afternoon ! DIY : Easy Twisted Hair Bun Hairstyle ! 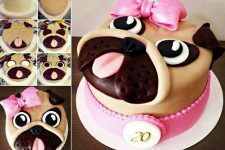 DIY Recipe : Make Your Own Pug Cake !